We met Alexis' sister and brother-in-law for dinner in Berkeley at a place they really like. And it was quite good. 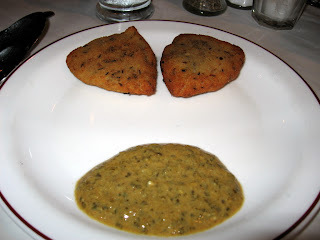 Indian crab cakes are certainly an interesting dish. 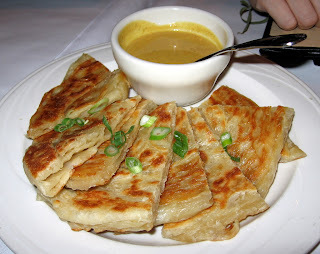 They were a bit too potato-y, but the acidic sauce was quite a nice contrast. They used white meat and it was dry, as is usual with white meat. The sauce was good though. This was really good. 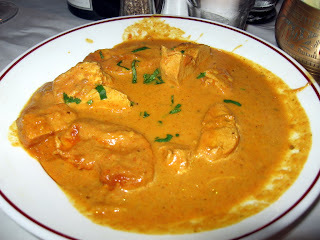 The paneer was soft and obviously homemade--a delight. 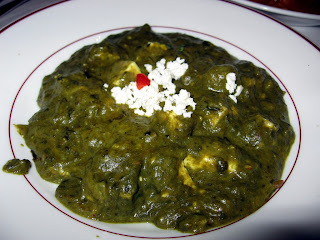 The saag was very smooth and had great flavor. 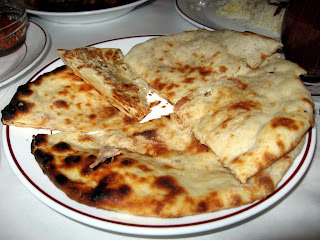 The naan was pretty good. The garlic was baked inside, which was nice because your fingers didn't get very dirty. 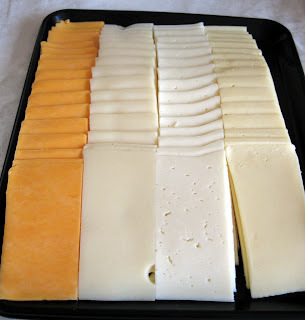 Every time we make the trek to Berkeley we have to go to the Cheeseboard Collective for lots of great cheese at very low prices. 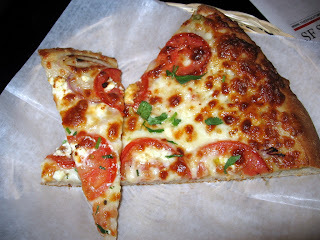 The offshoot next door is the Cheeseboard Pizza Collective which actually has really good pizza. 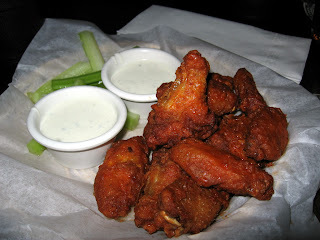 Very crunchy crust and flavorful ingredients. The best pizza we've had outside of NYC for a while. We ran some errands in the morning and were hankering for a filling meal. 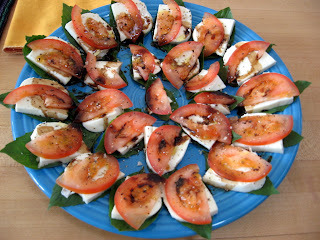 Tomato, fresh mozzerella and basil layered and seasoned with balsamic vinager, olive oil, salt and pepper. This was canned tuna that was in Giao's x-mas stocking and that Alexis' mom claims is the best ever. 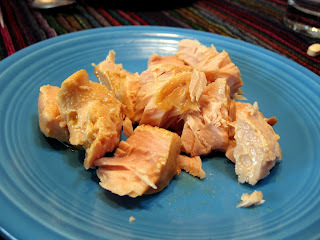 It was far better than regular canned tuna. Alexis got all these little ramekins recently and wanted to make some use of them. These little eggs were very tasty. Inside of each ramekin, arrange the tomato along the outside rin, creating a hole for the egg. Break the egg into the hole and season with salt and pepper. Bake at 400 for about 15 minutes, or until the egg is almost cooked. Put 1 tb of parmasean on top of each and bake for another minute or so, until the parmasean is melted. Sprinkle with basil. 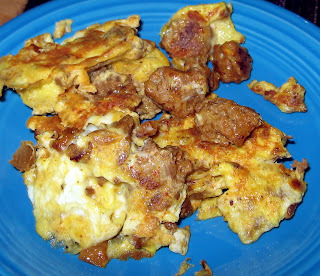 Click here for the recipe for cauliflower. The steak is marinated in worcestershire and steak seasoning, then pan fried for a few minutes on each side in a combination of butter and olive oil. 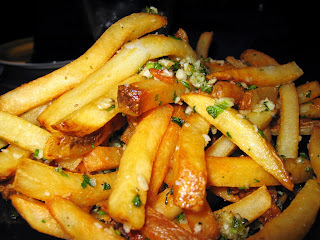 Very garlicky and pretty crunchy. 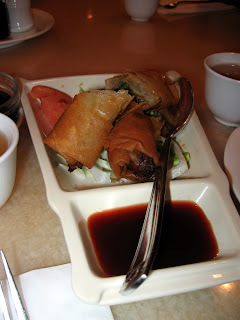 Wings were way too sweet, the eggrolls were boring, the wontons were not tried by Giao. 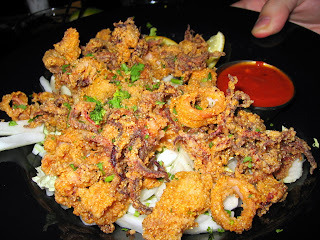 Average, but at least they had a lot of the tentacles we like so much. We'd been here for dinner before, but never for lunch. It was packed even with 3 floors after the normal lunch rush. 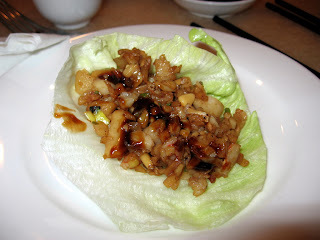 A bit better than your standard greasy Chinese, but for lunch not sure if it is worth the price. 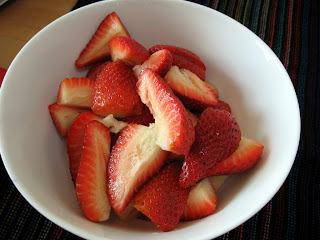 These looked way better in the picture. They were just greasy and had brown avocado in reality. This was a rather large dish--about 8 of the above little cups. It was pretty tasty and contained the interesting addition of pine nuts, something you don't often see in Chinese cooking. It seems we neglected to take a picture of the soup, but it both looked and tasted like every other hot and sour soup you've ever had. 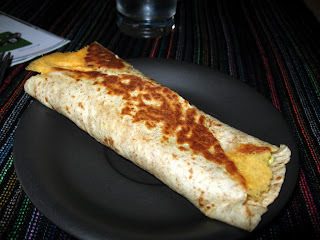 Scrambled eggs and cheese in a low carb tortilla, lightly pan fried. After walking out of Inland Empire an hour before it ended, but a good 2 hours into the movie, we were hungry for a real dinner. On the suggestion of a friend, we went to Slow Club, a place that we'd never been. We decided to give it a shot. At about 10pm on a Thursday night we wait to wait about 20 minutes to be seated. Not bad, considering they have a nice bar at the back. The menu had very few items and the only thing that stood out as interesting to us was the steak we both ordered. 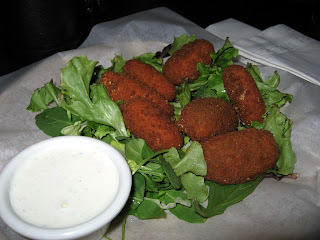 The atmostphere is nice, and the food was decent, but they need more choice on the menu. 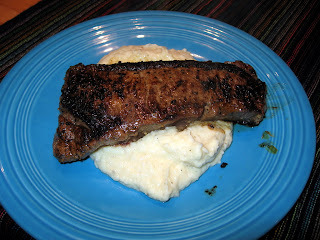 Giao's steak was well cooked and tasty but Alexis' medium rare was more like medium well. 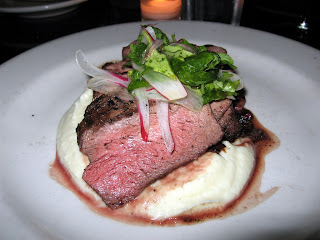 The puree was incredibly smooth and silky and the radishes provided a nice crunch, although I think they would have been better if they provided a little more bite. 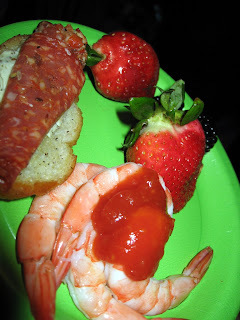 When we got to Inland Empire we realized that there was a pre-party with drinks and free food for us to partake in...good thing since we hadn't had time to eat dinner between work and getting to the 3 hours movie. We got enough food in our bellies to hold us over. Sautee onions and garlic in a bit of olive oil until beginning to color. Add chicken broth and kelp noodles and bring to a boil. Simmer until noodles are tender and then drain the broth. 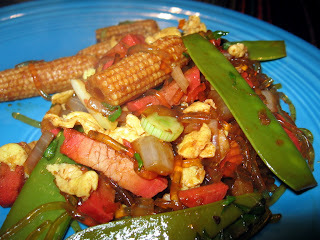 In another pan, sautee the snap peas and baby corn with all of the sauces and the galangal until tender. Then add in the pork, scrambled egg, and kelp noodles, onions and garlic and sautee until all ingredients are mixed thoroughly and warm throughout. 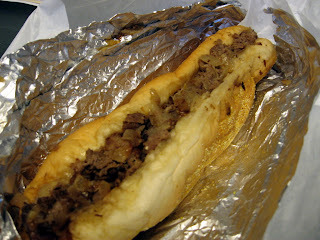 What's better than a cheese steak to break up your work day? A cheese steak with bacon. 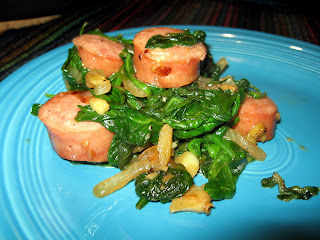 So easy and pretty tasty, especially with a hefty dose of hot sauce. Quick and easy. We had some kielbasa leftover from a football playoff party. Sautee the onions and garlic in a bit of olive oil until soft. 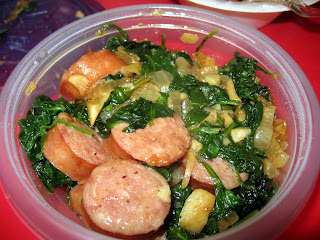 Add the spinach and sausage and sautee until spinach is just wilted. Not spicy enough, but crunchy and cheesy. The quiche from the other day was so rich we couldn't eat it twice in a row. We went to a slightly better than average by-the-pound salad and hot food bar. It was ok. We probably won't go there again soon. Also, oddly, the floor was shaking as we were eating and there was not earthquake going on. It was unnerving and annoying. 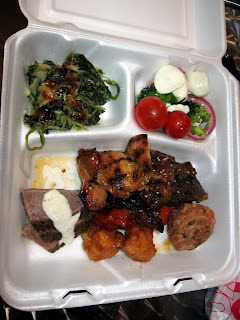 Spinach and Gruyere Casserole (pretty good actually), Caprese Salad (not seasoned at all), Steak with Horseradish (overcooked, but tasty), Pork Meatball (not good), Short Ribs (tasty and tender), Sweet and Sour Chicken (too breaded and pretty inedible). 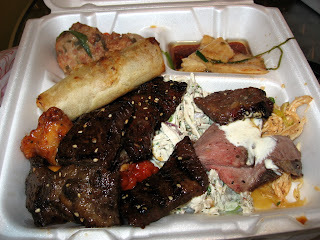 Pork Meatball (same as above), Eggroll (too breaded and soggy), Fish (a bit fishy, but the sauce was nice), Short Ribs (same as ablove), Steak with Horseradish (same as above), Chicken Salad (ok). 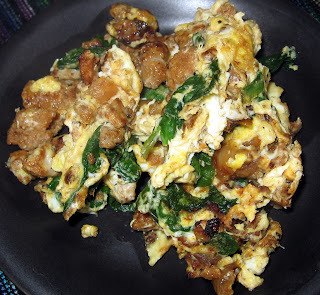 A filling and tasty breakfast that can be made in about 3 minutes. 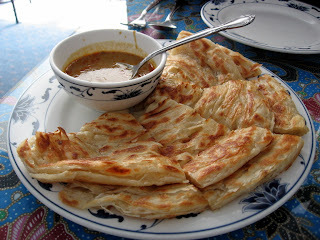 As loyal readers of our blog know, we've been obsessed with roti prata since our trip to Singapore in November. 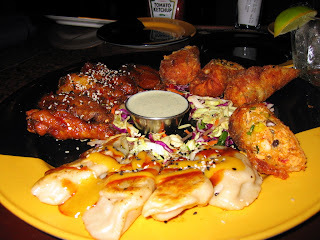 In order to rationalize our sinfully carby snack, we have decided to scour the Bay Area and come up with our first ever round-up. 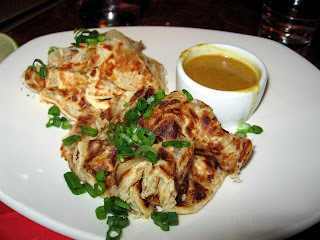 A roti prata dish is composed of two components, the bready, buttery goodness and the oft overlooked but essential curry sauce. Accordingly, we will rank the competitors on those two dimensions. Borobudur won for the perfect ratio of flakiness to stretch and lots of butter. It is also fairly filling for the price. 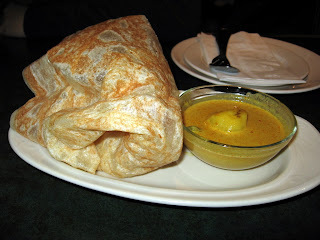 Straits Cafe in Burligame has superior curry because it contains the perfect ratio of creamy coconutiness to spice and depth of curry flavor. 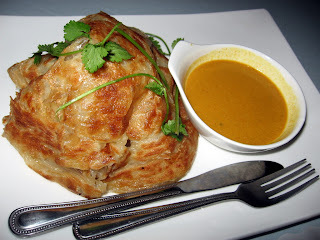 The consistency is also great, latching onto the roti, without overpowering it. 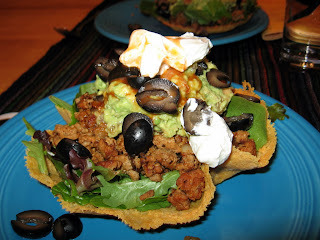 Fast, easy, delicious, and the taco meat is great for leftovers. 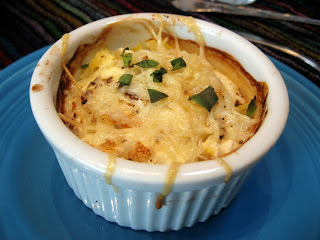 For a video demo on how to make the chupaqueso shell, click here. 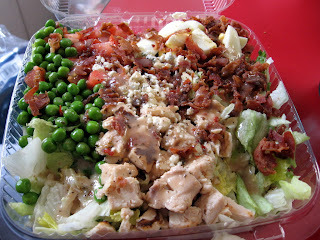 This is a very delicious salad has a nice addition of peas, and the chicken was very moist. 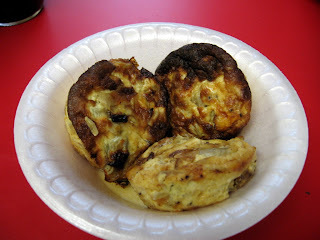 We recently got a silicone muffin pan and it works wonderfully or these crustless quiche. Sautee the bacon in a pan until translucent. Add the onions and sautee until everythingis crisp and brown. Drain the excess fat. Combine with all of the other ingredients. 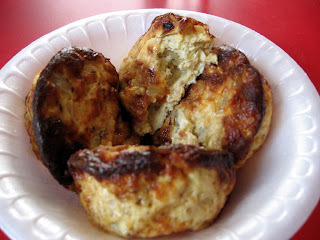 Ladel into muffin pan and bake on 350 for about 30 minutes, or until a toothpick comes out clean and the tops are golden brown. 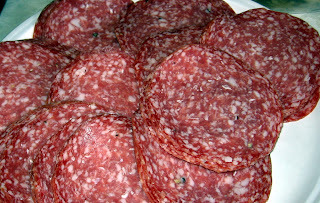 Good, but all salami is good. 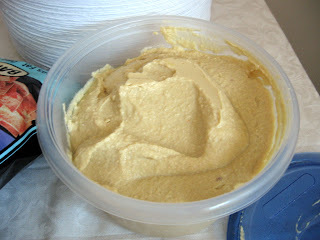 My standard hummus recipe, times 3. 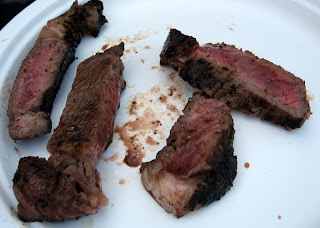 Done on the grill, this steak was very good. 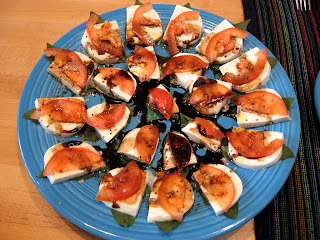 Fresh mozzerella slices, tomato slices and basil layered into perfect bites and seasoned with olive oil, balsamic vinager, sea salt and pepper.